Caregivers play a significant role at Family House, whether they are the spouse, son, daughter, adult grandchild, aunt, grandparent - or in Betty Hollingsworth's case, loyal friend. 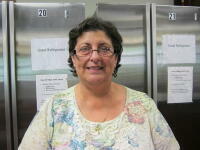 Betty's friend Pat Polera was diagnosed with chronic myeloid leukemia and has had three bone marrow transplants. Through it all and then some, Betty has been here for her good friend of 30 years, acting as primary care taker while Pat receives treatment at UNC Hospitals. This New York native and current Sampson County resident says she and Pat have supported each other during the best of times and during the worst of times. A retired nurse, Betty helps Pat navigate through a myriad of medical decisions and jargon, speaking with her current team of doctors who include Donald Gabriel and Paul Armistead in the BMT unit, and just being there for her friend doing what good friends do for each other. When guests stay at Family House for long durations – in Betty’s case, since June - friendships naturally develop among guests, other caretakers, patients, staff and volunteers. Betty says she considers Family House a safe place for her to come and rest after spending a long day in the hospital with Pat. There is always someone to talk with here, providing her with a wide network of newfound friendships and support outside of the hospital. Betty says she feels it is important to give back to Family House, too. You'll find her preparing hot meals for our guests, emptying the dishwashers, preparing pots of morning coffee or cleaning the kitchen. After Pat’s first stay in 2012, Betty's motorcycle group made Christmas stockings for our guests, young and old. (Their kindness was featured in one of our Family House diaries and is still available on our website). Betty’s caretaking and loyal friendship sets her apart and we appreciate the good example she provides for us all.